An ulcer is a sore or lesion that forms in the lining of the stomach or duodenum, which is the first part of the small intestine. Ulcers in the stomach are called gastric or stomach ulcers and those in the duodenum are called ulcers. Both can be referred to as peptic ulcers. If ulcers aren't treated or treatment isn't effective, serious complications may occur. The most common complications include bleeding, perforation of the stomach or duodenal walls, and obstruction of the digestive tract. As an ulcer erodes the muscles of the stomach or duodenal wall, blood vessels may also be damaged, which causes the bleeding. If the affected blood vessels are small, the blood may slowly seep into the digestive tract. Over a long period of time, a person may become anemic. If a damaged blood vessel is large, bleeding is dangerous and requires prompt medical attention. The symptoms of bleeding include feeling weak and dizzy when standing, vomiting blood, or fainting. The stool may become a tarry, black color from the blood. Most bleeding ulcers can be treated endoscopically by locating the ulcer and cauterizing the blood vessel with a heating device or injecting it with material to stop bleeding. 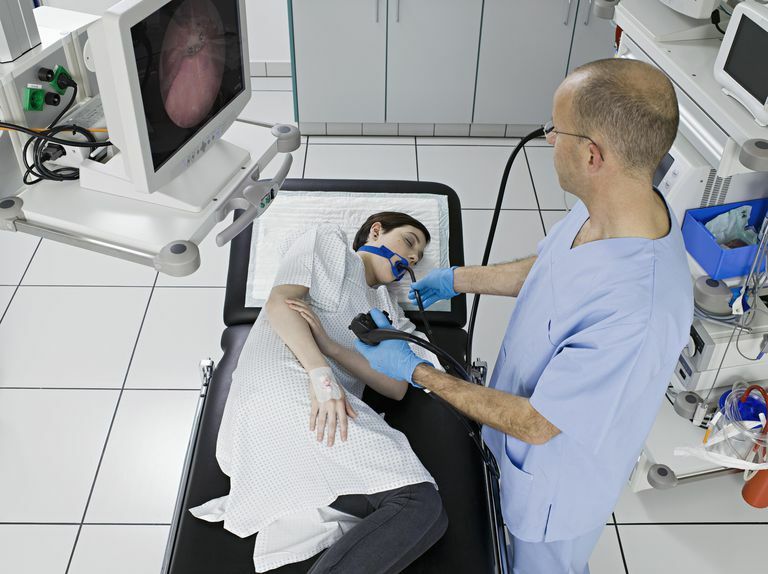 If endoscopic treatment is unsuccessful, surgery may be required. Sometimes an ulcer eats a hole in the wall of the stomach or duodenum. Bacteria and partially digested food can spill through the opening into the sterile abdominal cavity (peritoneum). A perforated ulcer can cause peritonitis, an inflammation of the abdominal cavity and wall. The symptoms of a perforated ulcer include sudden, sharp, severe pain. Immediate hospitalization and surgery are usually required. Ulcers located at the end of the stomach where the duodenum is attached may cause swelling and scarring. These ulcers can narrow or close the intestinal opening and can prevent food from leaving the stomach and entering the small intestine. As a result, a person may vomit the contents of the stomach. Endoscopic balloon dilation may be performed. The endoscopic balloon procedure uses a balloon to force open a narrowed passage. If the dilation does not relieve the problem, then surgery may be necessary.